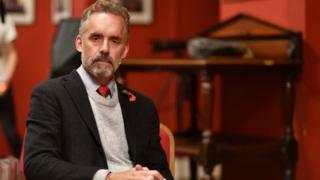 Dr Peterson labelled the decision a "serious error of judgement". But Stephen Toope said the university was prompted to rescind the offer due to the picture of a man wearing an "I'm a proud Islamophobe" shirt. University of Toronto professor Dr Peterson, whose views on gender have been condemned by critics, was set to spend a period in autumn at Cambridge's Faculty of Divinity. Image caption Visiting fellowships are "a courtesy extended to some academics from other institutions"
Professor Toope said the offer of the fellowship was granted on an academic basis but, "as a consequence" of becoming aware of the image, the invitation was rescinded. "The casual endorsement by association of this message was thought to be antithetical to the work of a Faculty that prides itself in the advancement of inter-faith understanding," he said. Dr Peterson has previously said he refuses to comply with Canadian laws compelling him to use the gender-neutral pronoun of an individual's choice, and in 2016 released a video lecture series questioning political correctness. Last week, Dr Peterson said he had not heard about the rescinding of the offer from the faculty, which announced its decision on Twitter, and said it publicised the decision "in a manner that could hardly have been more narcissistic, self-congratulatory and devious". The BBC has contacted his representatives over the vice-chancellor's claims.